It´s easy to ”drown” in men when dealing with history, and that´s a pity, because it´s also filled with so many fascinating, glorious and strong women. But there´s need to be room for them as well when we glance back at what once was. 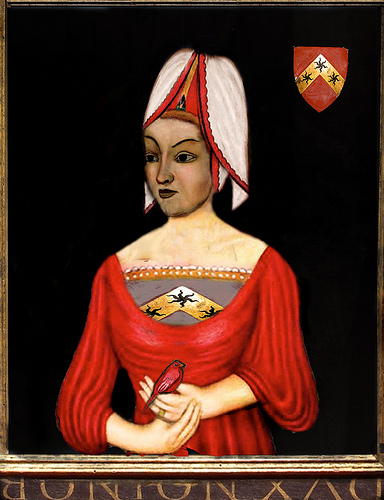 And here´s one of them, with whom I have only recently become aquainted: Eleanor Cobham, Duchess of Gloucester. Born in 1400 as the daughter of Reginald Cobham, 3rd Baron Sterborough 3rd Lord Cobham and his wife Eleanor Culpepper she was to be the centre of a scandal in her adult life when she was tried and convicted for witchcraft and necromancy in 1441. In her early 20´s she had been the lady-in-waiting to Jaqueline of Hainault, wife of Humphrey, Duke of Gloucester who in his turn was the younger brother of Henry V and Lord Protector during the minority of Henry VI. This Duke seem to have been quite the opposite of a loyal husband, maybe even for his own time, and according to Philippa Gregory he was said to have been equally in love with his wife and the land she was entitled to. Personally I find it quite obvious that his feeling was stronger for her lands, because when she ended up in armed conflict with her uncle and former husband over said lands in Hainault, he had no qualms about abandoning her, return to England and have the marriage annulled. So where does Eleanor come into the picture? Well, Humphrey, Duke of Gloucester did not return to England alone. Her former lady-in-waiting was with him, and as soon as his previous marriage was over and done with, they got married. Maybe this meant that Eleanor was set up for failure from the very beginning. Humphrey didn´t only leave a presumably devastated former wife behind him, he also left Hainault-English diplomatic relations in ruins. One didn´t however attack the Lord Protector and brother of the late king openly. Most likely it was easier to put the blame on his relatively low born new wife. Eleanor, Duchess of Gloucester attracted much criticism for her pride. There are divided opinions among historians and authors as to Eleanor had any children. 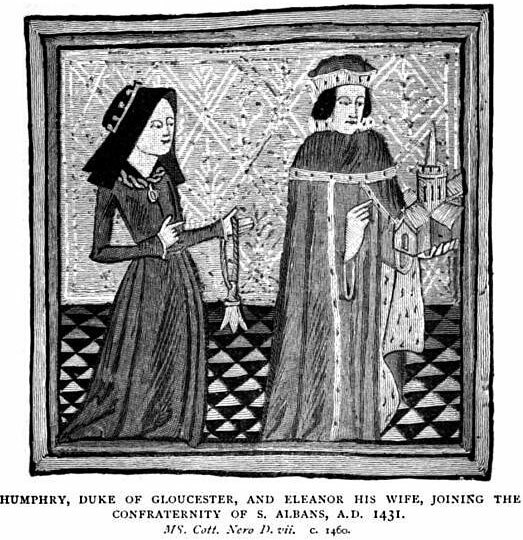 Humphrey, Duke of Gloucester had two illegitimate children, Arthur Plantagenet and Antigone Plantagenet. If they were not Eleanor´s children, that would explain why she actually did confess to some charges when she fell, and fell hard, from grace. The whole thing started as a conflict between Humphrey and his uncle, the Cardinal Henry Beaufort who decided that the Duke´s power and influence needed to be curbed, something he thought would be efficiently done by undermining the duke´s reputation. That was however easiest to do by attacking his wife who was accused of commissioning a horoscope that predicted ill-health for king Henry VI. Considering how his future would develop, it´s hard to see that alleged horoscope, if it did indeed exist, didn´t hold some truth. This constituted treason, but Eleanor wasn´t to go down alone. Roger Bolingbroke, a well-known astronomer, Eleanor Cobham´s personal physician Thomas Southwell and a herbalist and wise woman, Margery Jourdemayne, all died, Southwell in the Tower, Bolingbroke by being hanged, drawn and quartered and Margery Jourdemayne died at the stake. 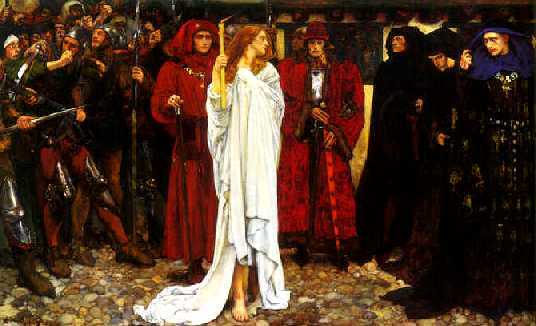 Eleanor Cobham, who only admitted to ordering potions to be able to conceive, which speaks against the theory that Arthur and Antigone Plantagenet were her children, was of course deserted by her husband, was imprisoned for life, first at Chester Castle in 1442, moved to Kenilworth Castle in 1443 and on to Isle of Man in 1446 where she stayed until 1449 and until her death in 1452, at the age of 52.